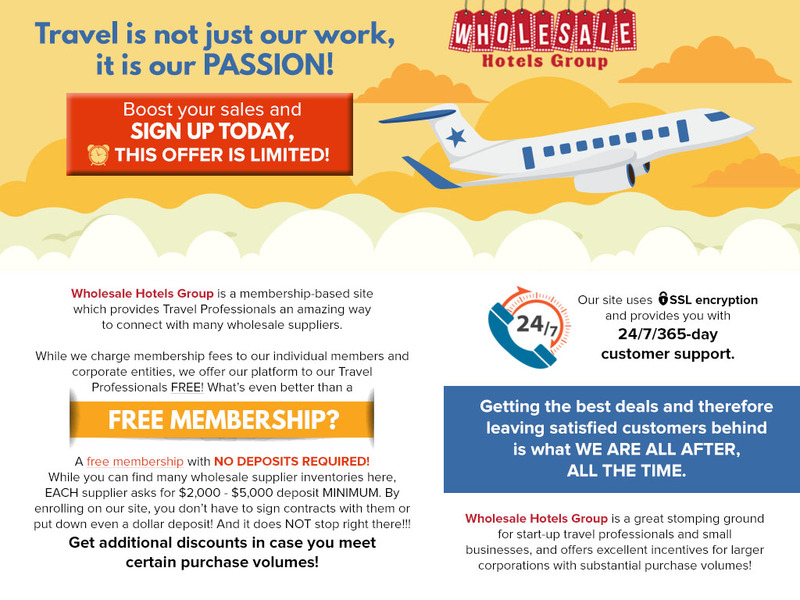 Wholesale Hotels Group - Hotel wholesale pricing at its best! Travel agencies ought to be able to offer some special packages, additional discounts on prevailing tariffs and a perk or two to woo clients which requires them to have access to hotel wholesale pricing. Travelers can ransack the virtual world and find deals that cater to their needs. If travel agencies cannot add any value or bring anything worthwhile to the table, there is absolutely no need for any ordinary traveler to use their services. Gone are those days when people would need a booking agent or someone to make all the travel arrangements. The internet has been an effective tool for empowerment and it has indeed become a leveler, much to the dismay of many who capitalized on their apparent specialization. For travel agencies to be sustainable and to remain relevant, there has to be a viable way to find and offer great deals that vacationers would not usually have access to. This is where Wholesale Hotels Group and the hotel wholesale prices come into play. Hotel wholesale pricing is not very different from bulk purchase of any other product, inventory or service. You pay less if you buy more. This applies to most products in the world. This also applies to services, from direct to home television subscriptions to spa treatments. Not all travel agencies have the volume of business to deal in hotel wholesale. Most travel agencies do not have the time, infrastructure and resources to establish a network of hotels, resorts and other types of properties that can serve as the foundation to negotiate hotel wholesale deals. Hence, it is imperative to find a way that is viable and financially wise. The path to hotel wholesale cannot be mired in complications. It cannot be inconvenient, unreliable or pricey. Hotel wholesale deals made available by Wholesale Hotels Group – one of the best hotel bedbanks out there – can empower travel agencies regardless of the volume of business they do. That’s right, your agency can book as little as one reservation a year or a thousand, your membership will stay active and what’s more important: FREE! Indeed, travel agencies can access hotel wholesale rates at no charge. Wholesale Hotels Group is not the only company that can offer the advantage of bulk booking and hence reduced rates. However, it is perhaps the only enterprise that is allowing travel agencies to take advantage of hotel wholesale rates without paying any deposits, meeting any sales requirements, Many players in the industry will charge a hefty security deposit for thousands of dollars which would tie up most travel agencies’ cash flow and affect their operations detrimentally. Avoid such investments, avert other expenses such as service charges and do not get entangled with a complex contract that you do not need. Wholesale Hotels Group is a one-stop shop, where with ONE SEARCH, you can see the best wholesale suppliers’ inventory and pricing without you having to pay those deposits to them and to have key industry accreditations, such as IATAN, CLIA or ARC. Wholesale Hotels Group – Hotel wholesale pricing at its best!